Orebic – the largest place on Peljesac Peninsula – old home of seaman’s – located on the southern coast of the Peljesac Peninsula. The surroundings is characterized by luxuriant Mediterranean vegetation. Economy is based on farming, fruit growing, fishing and tourism. 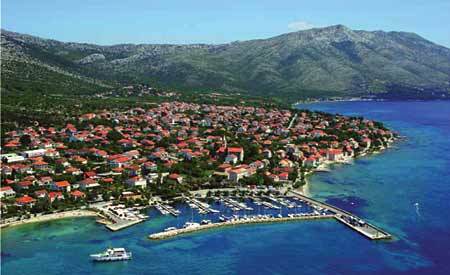 Orebic is also important ferry port for car ferries to Korcula – Domince. Among the beaches, the most interesting is beach Trstenica. (check photo). The town has ferry lines with Korcula Town. It is located on the regional road running along the peninsula. In the past the town was an important maritime centre; until the 16th century it was called Trstenica and was the duke’s seat under the Dubrovnik administration (1343-1806). – Stone walls and fortifications (on the hills of Gruda and Vizanjica) date back to the prehistoric times. The traces of a Roman habitation (remains of a Roman villa – villa rustica, graves) have been found as well. The small Baroque church has an early Christian marble relief built-in above the door of the closed arcade. The town is also home of the Maritime Museum. The Gothic-Renaissance Franciscan monastery (15th century) is located 2 km west of the town and features a collection of works of art. The monastery church was built in 1486 by Mihoc Radisic. The main portal features the relief of Madonna, a work by an anonymous disciple of N. Fiamberti; in the church is another relief of Madonna, made by Nikola Firentinac (Nicholas of Florence). On the hill above the monastery is a Gothic church, restored in Baroque style, dedicated to Our Lady of Karmen. Next to it are ancient sarcophagi and several age-old, huge cypresses, as well as a Baroque loggia and the ruins of the Trstenica duke’s castle.